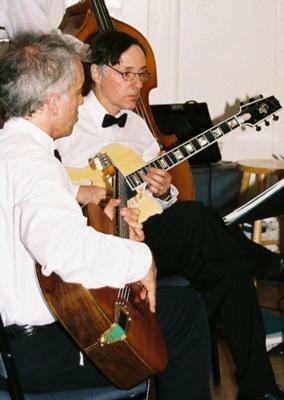 Intimate Spanish, flamenco, and baroque classical guitar; the sweet sounds and rhythms of Brazil including Bossa Nova and Samba; jazz standards and hot gypsy swing,Tango, European / French, and Flamenco jazz. Clients include Google, The Seattle Opera, Boeing, Nordstrom's and Microsoft. Recently awarded Wedding Wire 5 Star 'Brides Choice' Award 2015, Wedding Wire 5 Star Couples Choice' Award 2014, 'Best of Western Washington'2014, 2013. 'DOS GUITARRAS' - DUO / TRIO (two guitars, latin percussion) 'HOT CLUB SEATTLE' -GYPSY JAZZ (bass, 2nd guitar or accordion). 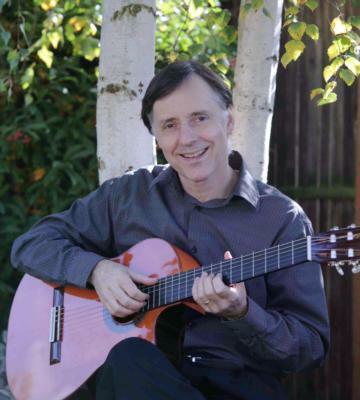 From studies in classical guitar with Carlos Barbosa-Lima and Guillermo Fierens (a student of Segovia) and over 28 years performing experience, Julian's performances include most of the Northwest's finest hotels, clubs, and theaters (performing four years at Serafina and the Hyatt Regency and the Sorrento). 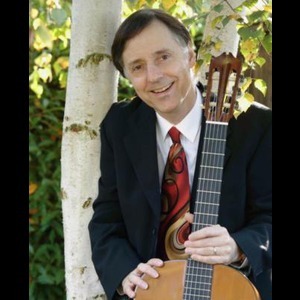 Julian is adjunct music faculty at Seattle Pacific University, has performed on many CD recordings, and at regional festivals including Bumbershoot. Julian has performed in Mallorca, Spain, and Scotland, Tahiti, Mexico and Canada, and appeared as a guest artist on television. He has accompanied Rosemary Clooney and Cab Calloway. Accompanied such notables as Rosemary Clooney, Phil Woods, Ed Ames, Little Anthony, Kenny Garrett, Robert Merrill, Patrice Muncell of the New York Metropolitan Opera ,The Mills Brothers and Cab Calloway. Julian C Trio on Northwest Passage CD and as guest artist on Skye Cantrell's CD Blame it On My Youth (2003), jazz vocalist Lincoln Briney's CD, Five (1996), recorded with saxophone great Freddy Greenwell (1998), and on vocalist Janis Mann's CD A Little Moonlight(1997), and as accompanist on Ladino Romanzas. Tiffany & Co. has been hiring Julian Catford for events at our downtown Seattle location for almost 10 years now. We continue to turn to him year after year, because we know we can always rely on him to set the right mood for each event from the moment we open our doors! Jenny Haight | Client Development Coordinator | Tiffany & Co. Hiring Julian to play guitar for our wedding ceremony and cocktail reception was one of the best decisions that we made in planning our wedding. He was exceptionally professional, and his music set the mood for our wedding. Several guests and my parents commented that he was a highlight of the evening. We met with Julian before the wedding, and he played several options ranging from traditional to contemporary for the ceremony and the reception. We chose traditional music for the wedding processional, and I asked him to play what he enjoyed and was best at for the reception. It turned out wonderfully! I highly recommend Julian C.
Julian was stellar. His talent so evident and his demeanor so easy. It was the perfect fit for our event (son's wedding). I had no doubt that our choice was the right one. Our family and guests were so impressed. The mood was relaxed and fun and the music just elevated the whole ambience to an even higher level. We thank Julian for his professionalism and his gift of music. He is forever part of the memories made on this special day. We were very pleased with your music for our event. You showed up on time, had a great set up with sound equipment and the music was very well liked. I will continue to use you at events for our hospital and recommend you for anyone interested. Studied and performed with Brazilian musicians; Arnaldinho do Cavaco, Guinga, Marcos Silva, Hamilton de Holanda, Carlos Oliveira. Studied classical guitar with Carlos Barbosa-Lima and Guillermo Fierens (a student of Segovia). Contact me for more music samples or information. Julian was an amazing guitarist. He was very accommodating and understood the venue and came prepared for any possible last minute location changes. My guests were extremely impressed with his skill and the diverse music he was able to play. Working with Julian was absolutely fantastic! We set up a meeting with him about 2 months prior to our event, and he played live music selections for us to choose from. The day of the event, everything was wonderful - his style was the perfect complement to our upbeat event. He was a joy to work with - his enthusiasm for his music is contagious and he had the best recommendations for our wedding. He was great with communication and follow up. Couldn't recommend him more highly! Julian is an excellent musician! He's professional, accomodating and he's a talented accoustical guitarist. I would definitely book him again for another event and would recommend him to anyone looking for a musician for their event. He's really wonderful and a delight to work with . . .
Julian was an inspried choice for our wedding. We got so many compliments on what a wonderful addition his playing was for our service. He worked with us to customize our song list and to make sure our vision happened. He was so professional my officiants were beside themselves - THEY LOVED HIM. He was fantastic, made our day that much more special and his professionalism and talent lay at the heart of his ability to make it all happen. What a pleasure it was to have Julian entertain at my husband's retirement party. His superb acoustical guitar music was the perfect complement for our mid-size crowd in our backyard venue. All our guests raved about Julian's performance. Julian was very considerate, prompt, & professional. He also gifted my husband a copy of his new CD, which is just amazing. We look forward to another opportunity to have Julian back again in the future. Julien was fantastic! He was very accommodating, played beautiful music which really added to the atmosphere of our event, and even showed interest in our mission. I would absolutely hire him again. Julian was a pleasure to work with. His calm and professional demeanor was a plus to an important event. He has a great sense of what music to play when and at what volume. guests at our event loved his music and I received great feedback that his music made the event feel elegant. Julian performed at a party that I had given as an auction item to raise funds for Treehouse. It was a gift to have live music, and more than a gift to hear music of this beauty from a performer of Julian's accomplishment and talent. Thank you so much!! Julian's music was perfect for our wine & cheese event at Chateau Ste. Michelle. He was very professional and his music created the perfect ambiance for our party. Julian was a complete professional in every way. He was easy to work with and was super knowledgeable and friendly in our discussion of wedding music for our event. He was on time and played exquisitely. He added a very special touch to our unforgettable day! Please note Julian C will also travel to Bainbridge Island, Bellevue, Kirkland, Mercer Island, Port Gamble, Suquamish, Edmonds, Bothell, Mountlake Terrace, Bremerton, Kingston, Lynnwood, Poulsbo, Redmond, Everett, Port Orchard, Renton, Indianola, Silverdale, Woodinville, Keyport, Vashon, Issaquah, Olalla, Rollingbay, Snohomish, Hansville, Kent, Mukilteo, Seabeck.